The Digital Research Library of Illinois History Journal™: The Story of Chicago's Insane Asylum in Dunning. 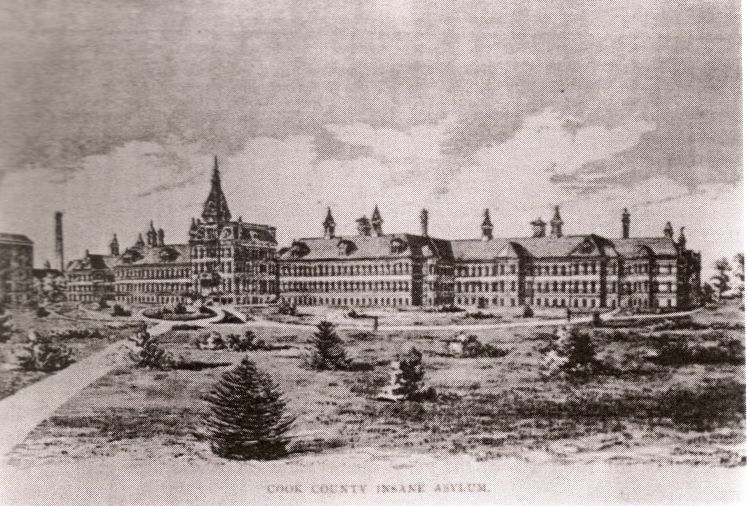 The Cook County Insane Asylum at Dunning in the late 1800s. 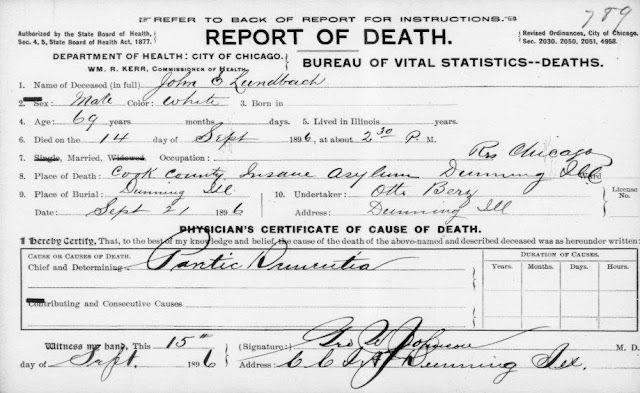 In 1989, genealogist B. Fleig studied the available records about Dunning and documented that more than 15,000 people had been buried in the graveyards there. But the records are incomplete, and Fleig extrapolated that the total is closer to 38,000. Neighborhood resident Silvija Klavins-Barshney, 50, says she was shocked when she found out about Dunning’s graveyards a couple of years ago. She serves as the vice president of the church board of the Latvian Lutheran Zion Church, which is located inside a building that was part of Chicago State Hospital. I remember back in 1954 waiting for a bus to take me further west on Irving Park to Harlem Av. Dunning was directly across from the bus stop. 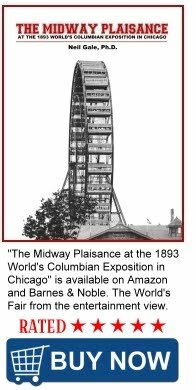 The victims of the Chicago fire were taken there. Graves were also relocated there to open the land for the Chicago Hisorical Society and it’s Park. The family who refused still have graves near the building. What a poignant story, and well told. However, I chuckled when I read how parents would scold their children with the threat of being sent to Dunning. 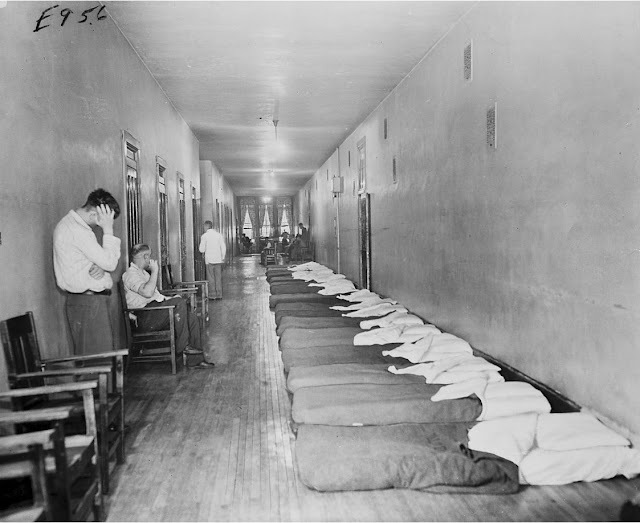 I grew up near Detroit and not far from the city of Ypsilanti, which also had an insane asylum. Back in the day we heard the warning, "I'll send you to Ypsi!" i remember my mother telling me we had an aunt at Dunning. my mother would say "she was a little different". the aunt passed away there and buried there. i also remember my uncle telling me that inmates would jump the fence and run over to the bars across the street for a beer if they could get one before getting tracked down. what a bad place. i could never think about living on that land. My grandparents lived across the street and when we would visit patients would be running around the property.Plus the gangway. My mom used to hand out cigarettes and cookies to inmates who would stand behind the high fence which surrounded the bus turn around just west of Narragansett on Irving. She would be crying the whole time because it made her so sad. We lived near Montrose & Narragansett and, one daydin 1988 or so, my mom took in a young man, maybe 16, when he had wandered off the grounds. She fed him a sandwich while I called the cops from my bedroom land line!